When we think of Spanish wines, we think of Rioja wines. The Rioja wine region is the central point of Spanish wine. If you are traveling in Spain and are a wine lover, at least a two-day stay in Rioja wine region is a must. There is so much to see: Bodegas, architectural wonders, mountain beauty, ancient wine towns, and of course the vineyards winding along the Ebro River. The most important grape is the red grape Tempranillo. Rioja also makes some delicious white wines from the Viura and Malvasia grapes. We have listed only a handful of the Rioja bodegas to visit. These are ones you are sure to enjoy. Finally, be sure not to miss the most fantastic wine museum in the world, the Dinastia Vivanco Museo de la Cultura del Vino in the ancient Rioja town of Briones. Don’t miss a visit to the Rioja wine region. Bodega Bohedal – Cute and family owned for about 150 years, 120,000 bottles annually. 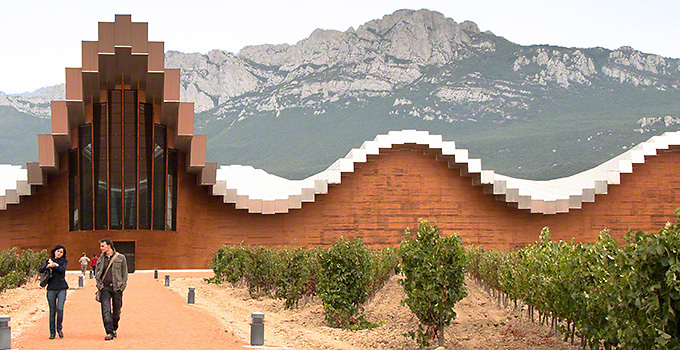 Bodegas Ysios – The architecture is stunning, a must see.